Ashley Amundsen’s story is a feel-good one that Journey could have scripted: a small-town girl from Salem, Utah who left her hometown for Southern Utah University and hoping anywhere after that. First convinced that a degree in graphic design was her destiny, Amundsen began scheming a different future when she joined Future Business Leaders of America-Phi Beta Lambda (FBLA-PBL) in 2011, which resulted in changing her major to advertising and soon after obtaining leadership positions and award nominations. Boarding a plane to Tennessee this last month ultimately skyrocketed this Salem native into a highly successful future through the FBLA-PBL National Leadership Conference. Also in attendance was Jake Amundsen, junior graphic design major, and Brant Parker, junior finance major. With 50 events to choose from, these SUU business students left the 250,000 other competitors in their wake. The Amundsens brought home fifth place in Desktop Publishing and tenth place in web design. Parker competed in the community service project event and garnered sixth place for his work at the Teddy Bear Den in Cedar City. But on top of the medals, Ashley Amundsen will continue to have a lasting effect on the nation’s largest and oldest collegiate student business organization as she was elected western region vice president. “I have been serving in leadership positions since I joined the group and with this being my last year I wanted to really influence this group I love,” explained Amundsen. In this role Amundsen will work with chapters across the western states, ensuring they are organized and help with recruiting new members. With a goal to one day be a marketing director, Amundsen knows that her experience with FBLA-PBL will ensure her success after graduation. 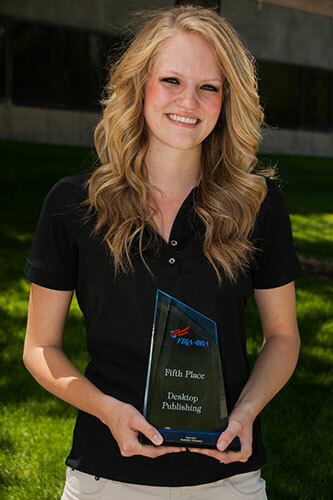 These aren’t the first T-Birds to take the FBLA-PBL competition by storm; Rebecca Zitting Holman won first place in Future Business Teacher of America in 2010, and two years later the School of Business’ community service project, the Teddy Bear Den, won first place. Also in 2012, now MBA student, Jeff Hertig, took seventh place at nationals in the sales presentation. Templin went on to say that this application of knowledge acquired in the classrooms and the projects they complete, students earn the right to compete national, which in turn gives SUU School of Business students the skills necessary to be affluent and thriving graduates.